The Antietam National Battlefield Memorial Illumination is held each December in honor of the soldiers who fell during the Battle of Antietam during the Civil War. The annual event is presented at the beginning of the holiday season to remind visitors of the sacrifices made by members of the military and their families. 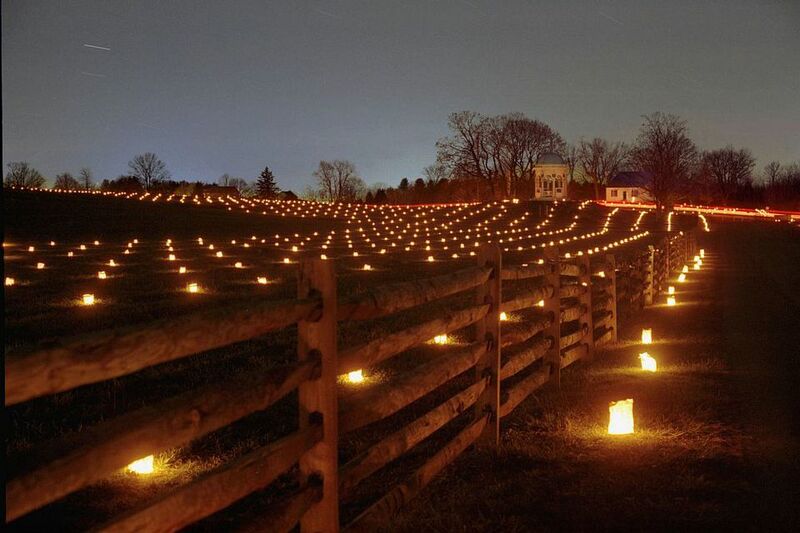 At twilight, 23,000 luminaries are lit, one for each soldier killed, wounded, or went missing during the bloodiest one day battle in American history. The free, 5-mile driving tour is the largest memorial illumination in not only the United States but in all of North America as well. The first memorial illumination was in 1988 and it continues to be a popular community event, drawing in history lovers from all over the world who enjoy visiting National Battlefields near Washington D.C. The date of the Illumination is typically on an early Saturday in December, but confirm the details via the official website calendar. There is always a rain date scheduled as well if the event gets postponed due to weather conditions. Antietam National Battlefield is a National Park Service protected area situated on Antietam Creek in Sharpsburg, Washington County, northwestern Maryland. The park commemorates the American Civil War Battle of Antietam that occurred on September 17, 1862. Bicycling is permitted on paved park tour roads and parking lots. Riding is prohibited on all sidewalks, agricultural land, and the Snavely's Ford Trail. Horseback riding, in groups of ten or less, is permitted on all paved roads and designated trails. Riding on paved foot trails, parking areas, or on agricultural lands is prohibited. Fishing is allowed on the Antietam Creek with a valid Maryland Fishing License. Boating or tubing on the Antietam Creek is permitted. Picnicking is allowed, but not in the Antietam National Cemetery, Mumma Cemetery, inside the Dunker Church, inside the Observation Tower, on the Burnside Bridge, or any monument. Antietam National Battlefield is approximately 70 miles northwest of Washington, D.C., 65 miles west of Baltimore, 23 miles west of Frederick, and 13 miles south of Hagerstown. The main entrance to the Illumination is Richardson Avenue off Maryland Route 34. From Boonsboro, travel west on Route 34. Once there, you will join a line of cars that will form on the westbound shoulder. Visiting the memorial is a relatively stress-free outing, but these tips will ensure that everything goes smoothly. The Illumination opens to the public at 6 p.m. Visitors are prohibited from walking the tour route. Be patient and prepared for a very long wait. The vehicle line to enter the memorial can be upwards of two hours long, or more. The Antietam National Battlefield Visitor Center closes at 3 p.m. each day, including the day of the Illumination. No bathroom facilities are located along the route. Vehicles must use parking lights only (to the extent technology permits this) and continue through the event without stopping.